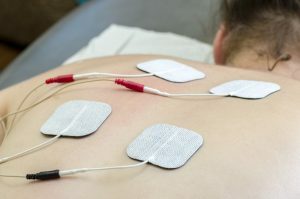 Electrical stimulation, such as Interferential current therapy (IFC), is an effective option used by many healthcare providers to relieve pain and accelerate the healing process, getting your body back to a healthy, pain free state. The high frequency signals of IFC penetrate through the skin into deeper tissues. First, your chiropractor will begin with a full history and exam to assess if the procedure will be appropriate for you, and to determine if you might benefit from this treatment. If so, she will place electrodes on your skin around the affected area and the IFC device will transmit electrical impulses in minute quantities through your skin. Underlying tissue and nerves are stimulated which reduces pain and supports healing. These impulses are generally not painful; in fact, patients describe the sensation as a minor buzzing, pins and needles sensation, or pleasant tickling. IFC has been proven to stimulate endorphins, the body’s natural painkillers. This form of therapy is also effective in reducing pain, inflammation, edema, and muscle spasms. Generally this form of treatment is very safe with few side effects, although it is contraindicated in some cases (such as for patients with a pacemaker).